There is literally no hairstyle trending harder than the half up, half down bun. For kids of the 90s, this was probably your go to style all throughout the decade, but with the serious grunge resurgence this season it has made a very convincing comeback. We’ve seen celebs rocking it everywhere from the red carpet to the gym and it ain’t no wonder, cause it is pretty damn flattering. The high bun gives the illusion of an instant facelift, but the relaxed lower half gives you a much more chilled out, California girl vibe, so you are getting the best of both worlds in a single hairstyle. This look is all about treading the line between looking effortless and sloppy, so follow these tips to ensure your hair-do is on the right side of that line. It works best with textured hair with a natural looking wave – anything too straight or too curly won’t work. Flip your hair upside down and spritz with your favorite salt spray and then pull the hair around your face from your eyebrows upwards into a twist, securing with pins or a clear elastic tie. Don’t be afraid to play with proportion – more hair up or down may suit your face shape. Finish the look by running your hands through your unsecured hair and loosening the bun so it doesn’t look too severe in comparison. And voila, you have mastered the hair do of the season. Not sure you can rock the trend? 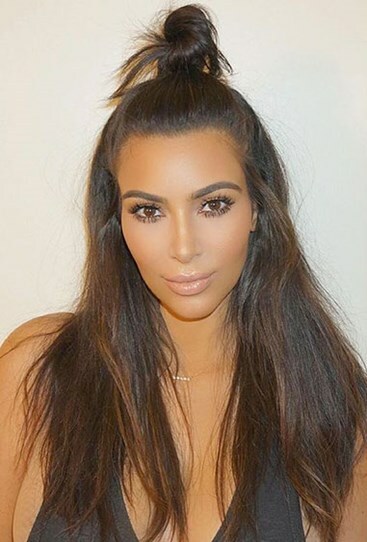 Check out the celebs loving the half up, half down look and get some hair inspo.